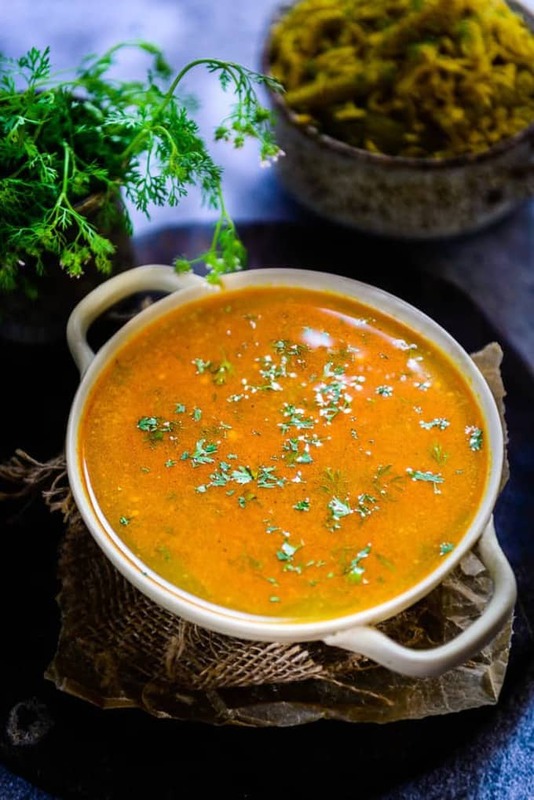 Katachi Amti is a Maharashtrian style thin, tangy and spicy dal which is mostly served with Puran Poli. It is made using the leftover water that is got after boing the dal for Puran Poli stuffing. Here is how to make Katachi Amti. In Maharashtrian cuisine, Katachi Amti is quite popular. Made using chana dal, jaggery, tamarind, coconut and various spices, Katachi Amti tastes tangy and slightly sweet. As Gudi Padwa is just around the corner, I thought of exploring different delicacies of Maharashtrian cuisine and savour them. Katachi Amti is one such interesting recipe that is easy to make and a treat to relish. Katachi Amti tastes superb with Puran Poli, however, you can even relish it with Zeera Rice or plain rice. 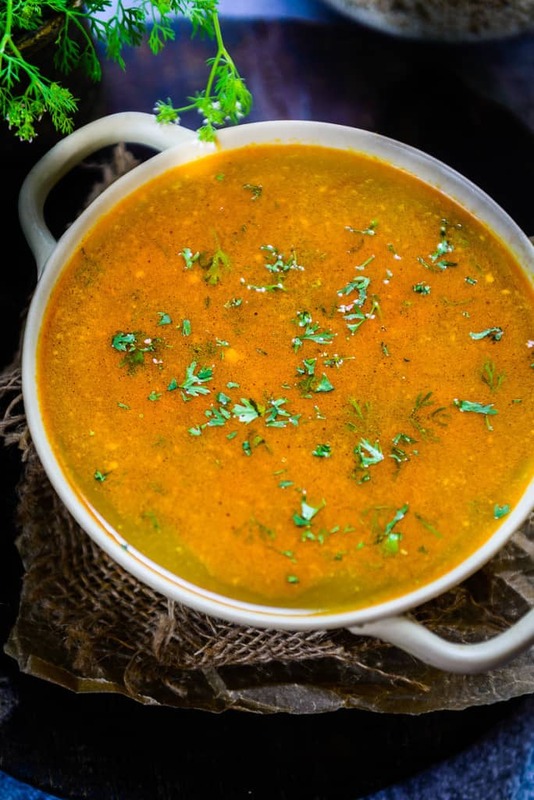 The recipe of Katachi Amti is different in many Maharashtrian households. In some households, Amti is made with mashed chana dal, in that case, they boil chana dal with more water. Once the chana dal gets boiled, they mash the dal and use that thin dal to make Katachi Amti. Some households even prefer to add onion in the Katachi Amti in order to make it more flavorful. For that variation, while preparing tadka, they add finely chopped onion and saute till translucent then carry out the usual process for making the Amti. I have used only the water that was left after boiling the dal and cooked the dish in the same pan so that the dal that was stuck to the sides of the pan acted as a thickener. To name a few benefits of chana dal, it contains a high amount of fiber. Chana dal helps in lowering cholesterol. It is even a good source of calcium and protein. The best part is that chana dal tastes equally yummy and nutritious at the same time! 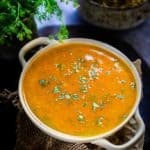 So, this Gudi Padwa, try scrumptious Katachi Amti, let me know how it turned out through your tweets/comments, I would be glad to hear from you as always. Also, follow me on Facebook, Instagram to learn more Maharastrian recipes this week! Katachi Amti is a Maharashtrian style thin, tangy and spicy dal which is mostly served with Puran Poli. It is made using the leftover water that is got after boing the dal for Puran Poli stuffing. Dry roast the ingredients listed in roast and grind into paste, until slightly browned and fragrant. Make a paste of these ingredient using little water. Wash chana dal and add it in a pressure cooker along with 4 cups of water. Pressure cook until the dal is done. Strain the dal and reserve the water. The dal can be used to make Puran Poli and we will use the water to make Katachi Amti. In the same pressure cooker, add the dal water and the paste that we made earlier. Once the oil is hot, add mustard seeds, cumin seeds, curry leaves and hinge and let the seeds crackle for a few seconds. Simmer the heat and add turmeric powder and red chilli powder and fry for 4-5 seconds. Pour the oil in the pressure cooker with Dal water and Spice paste. Bring the amti to a boil. Add salt, tamarind paste, jaggery and fresh coriander and mix well. Serve hot with Puran Poli or Steamed Rice. I use the puran that is made it gives more depth to the flavour.